On the Gitchee Gumee – Jenny and Jonathan Got Married! One late July or early August more than a decade ago, I saw Lake Superior for the very first time. At Whitefish Point, on Whitefish Bay. If you ever listened to Gordon Lightfoot’s “The Wreck of the Edmund Fitzgerald,” then you know that this ballad details the real life tragedy of a freighter that sank during a bad storm before the ship could reach the shelter of Whitefish Bay. On my first trip to this lake, those of us in the car that day discussed the lyrics to Lightfoot’s song. We wished to hear the full song so that we could solve a question about the lyrics. None of us owned MP3 players, smartphones did not exist, and we had no CD of the song with us in the car that day. We had just the car’s radio for music. We were out of luck. Then the local radio station cut into “The Wreck of the Edmund Fitzgerald” in order to issue a severe thunderstorm warning. We missed most of the song. By no means will I complain about the storm warning. But – oh, the irony. A few days ago, we returned to Lake Superior. This time we didn’t visit Whitefish Point. 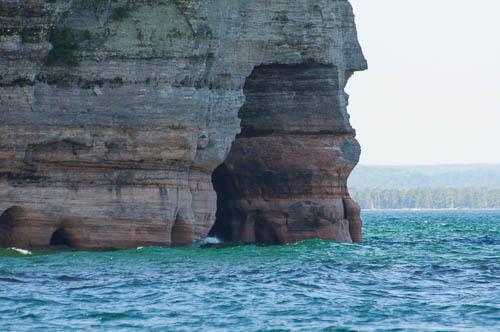 We went to see the Pictured Rocks National Lakeshore in Munising, Michigan. 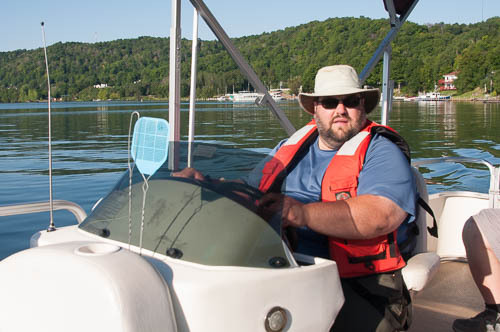 We learned that one must be on the water or in the air for the best views, so we rented a pontoon boat. Jonathan didn’t take a single photo on this trip. Why not? Because he piloted the boat for the whole trip. Here is a photo of Jonathan before we pulled away from the marina. 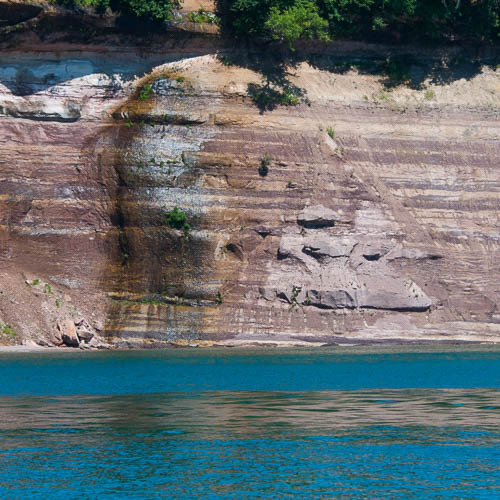 These first three landscape photos are all of Miner’s Castle. I could actually just blog exclusively about Miner’s Castle for the next year because I took dozens of photos of it from various angles. 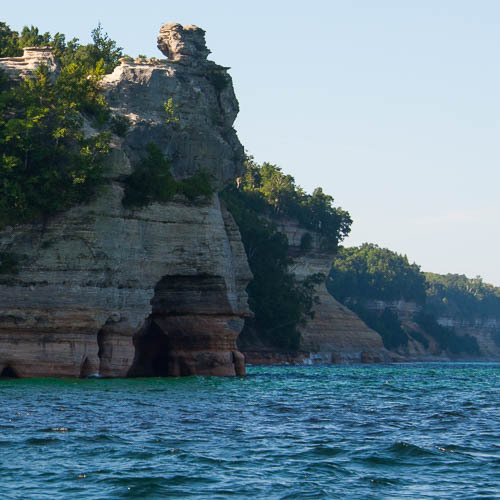 When I first told Jonathan (several years ago) that I wanted to see Pictured Rocks, I really meant that I wanted to see Miner’s Castle. So, of course I am happy that we got to see it! 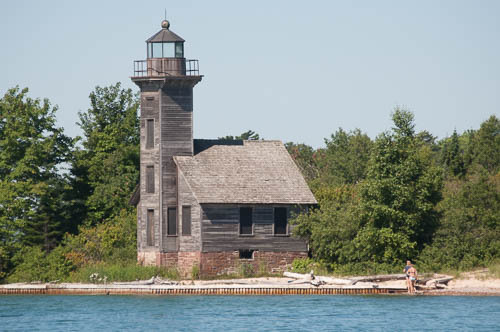 We also saw the Grand Island East Channel Light. I may blog about it later in more detail. In 1903, a shipwreck happened in front of it. 1.) I took all of my photos with a telephoto lens. Therefore, in my photos Miner’s Castle looks much closer than we actually got to it in the pontoon boat. 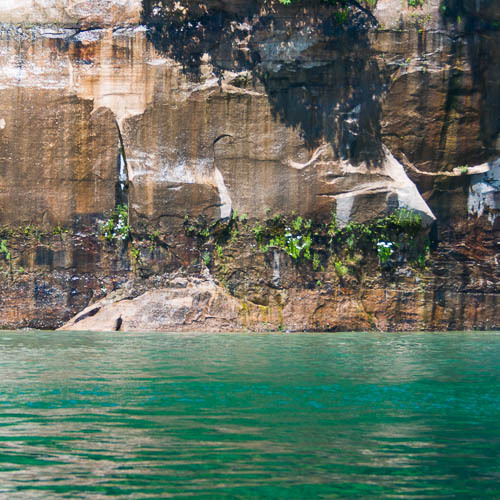 Many people chose to visit it by guided tours in sea kayaks. 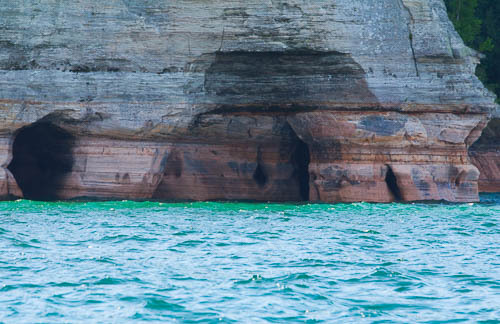 In fact, we saw many sea kayaks during our Lake Superior boat trip. 2.) This news article describes a guided sea kayak tour that didn’t end satisfactorily. This incident happened last week. Thank goodness that all involved were apparently rescued. 4.) Multiple boats from Glass Bottom Shipwreck Tours passed us. We observed that these boats were completely packed with passengers. We speculated how easily the passengers were able to move about in order to easily view the sights. However, here is their website, which gives some good information about shipwrecks in the area.